This is done in Fedora, RHEL, CentOS, many other Linux distribution, and Unix-like systems for security concern as it will show the password in clear text format. What is the fix on a Linux or Unix bash shell? The -t option force pseudo-tty allocation. This can be used to execute arbitrary screen-based programs on a remote machine, which can be very useful, e.g., when implementing menu services. 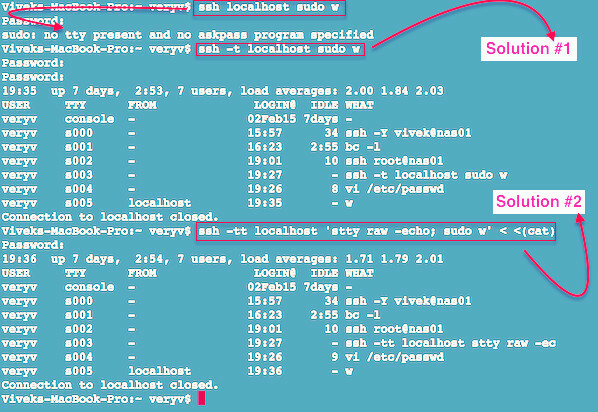 Multiple -t options force tty allocation, even if ssh has no local tty. How Do I run command without using the -t option? ssh user@server1.nixcraft.in su vivek -c "/scripts/job1 /nas"